The SKEDD Principle: SKEDD uses the printed circuit board like a power socket. SKEDD is the further development of the press-fit technology and uses the same familiar principle of bonding to four edges in the metallized circuit board hole. Contacting is made by a stamped contact with spring characteristics (the SKEDD fork) whose contact arms adapt to the contour of the drill holes and establish a secure connection between the connector and the printed circuit board. The circuit board does not have to meet any special requirements – metallized holes are standard. 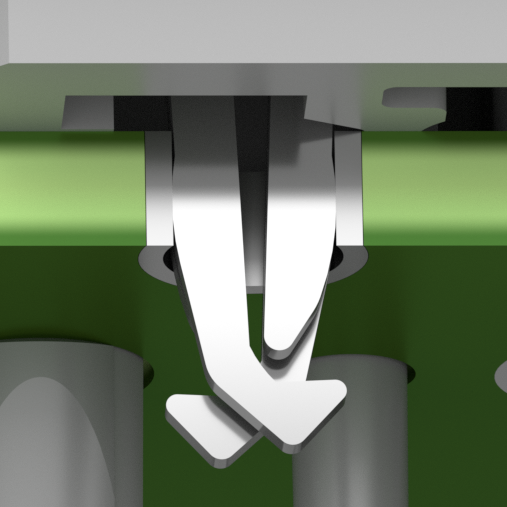 The mechanical fixing of the SKEDD contacts in the printed circuit board is realized via plastic housings, just as is the case with conventional connectors. The housing support the locking and unlocking in the printed circuit board, for example in the form of expanding rivet solutions. Simplified: SKEDD uses the printed circuit board like a power socket.